Dimensions are now going to be 160 studs wide and 80 studs deep. A river has cut it's way way through, as well. That is all up to this point. Hey I'm away from building for a week but I got just a few photographs up of what I'm working with and I'd love any feedback you all have, especially in the case of the window frames. I'm hoping to have at least one more building completed. Have a look! CreativeAnarchy wrote: Hey I'm away from building for a week but I got just a few photographs up of what I'm working with and I'd love any feedback you all have, especially in the case of the window frames. I'm hoping to have at least one more building completed. Have a look! Personally I prefer the window frame on the right of the picture, though I think either one would work. The left one seems a little more fancy/decorative, the right one a bit more utilitarian. As we get closer, how is space planning going? I'm really hoping to get 60" x 90" of table space. I can be somewhat flexible at my edges, but it will help to know what's on either side of me. My display as always is built of various Base 8 BPB modules. If all goes well, I will fill about 1/3 my space with a large mountain with a castle on top. The mountain will come down to my right hand edge, so it might be worth having a bit of buffer space on that side otherwise someone's creation might have a mountain looming over it (which might also be just fine). I will be arriving Thursday and will bring some amount of brick for blending (and if things go well, but not ideal, I will actually be building some of the mountain on site). I should add that if there was more space, and it all fits in my car, I could probably fill almost 60" x 120". If I went that big, I'd be happy to work some folks smaller buildings or terrain into my display. Okay, y'all, I'm back online...mostly. It's been a really busy summer and whatnot. My apologies for not being about. I will go over everything so far and see what kind of holes we have. It is looking great so far. I have the table layout and we have plenty of room. Planning is going well. I will have more details for y'all after I complete some email conversations that are going on behind the scenes. More to come! ffilz wrote: As we get closer, how is space planning going? You are going to be in between AK_Brickster and myself. AK will be to the right (from the public's view) and I will be on the left. 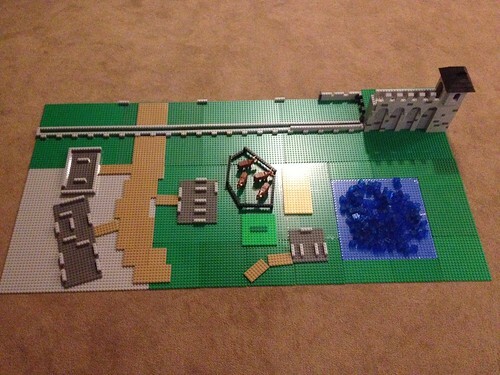 My edges will be green and one brick high on baseplates. Probably a forest there, but no roads or rivers that you have to worry about. Have you decided on whether or not you want 90" or 120". Either will work, I just need know. JoshWedin wrote: Planning is going well. I will have more details for y'all after I complete some email conversations that are going on behind the scenes. More to come! I have to take another look at the mountain pieces I am re-purposing, I think it would actually be quicker for me to fill 120" (less mountain to rebuild). In that case, I would have water on my right hand side, but I think I would have enough space to make it a river if AK will have land terrain. Let me have a look at things in the next couple days. I am fast closing in on having the new castle relatively finished so can devote some time to mountain building. I could definitely make room for a few smaller items if some folks had some smaller base-8 BPB bits they wanted to incorporate into a large display. p.s. After a quick look at my paper plan, I think actually with 120" width, I would go for a large river between two halves of my display. My new castle (which will be a lion faction castle) would be on the left side, and my old black scorpion castle would be on the right side). Sounds good. I'll put you down for the 120" then. Are we going to have a big water area this year? I just did some quick playing around, and I wouldn't mind being on both sides of a big water area. I'm playing with the idea of having my Scorpion castle and my orc cave on the right hand side of water with the new Lion castle on the left side. More water would leave room for a couple Troll Warships to be crossing the water. I would still fill 60"x120" of space, but could easily handle 60"x60" of water in the middle of my display. ffilz wrote: Are we going to have a big water area this year? Let me think about this one for a bit. The previous big water area was mine and I'll have to see how much I can field this year. Some of my blue baseplates are being used in another project. I am doing a water intensive area, but haven't gotten all the dimensions finalized. I'll work it out in the next day or two. Sure thing. I've got plenty of blue baseplates. I could probably handle a 30x60 water section. Then if folks have ships and such, they would be welcome to place them in the water area. If you don't want to go that big, even an additional 10" to make my display 130" wide would give me a little more wiggle room. We have tons of room right now. Easily have room for you to go to 130". Ok, I'll assume at least 130" then. As we get closer, and maybe a better idea of what all is coming, we can add more water if it makes sense. Sounds good. I'll keep that in mind too. If we need to fill space, water is a good way to do it. AK_Brickster wrote: Here is my layout that will go next to Fraslund's on the Left side. He is going to build a bridge across his river that will lead straight out through the gatehouse of my wall. Filz, if I'm reading this correctly, you'll be up against the bottom edge in the picture. I was planning on having a road go off there. If you are going to do a river between you and I, maybe we can build a bridge over it or something? Feel free to 1:1 me so we can work out the details. I will be BpB Base-8 compatible.